I had the opportunity to attend one of our districts data review meetings with my principal. It was very interesting to see how personnel from the district office dissect and internalize information. As I sat there listening to the PPT presentation that my principal worked frantically to create for this meeting, her supervisor stopped her at the slide that had a copy 5th grade Language Arts teacher’s assessment on it. He began to examine the assessment closely and said, “That’s a good assessment”, but then added that the teacher should add the DOK level of each assessment item. He then went on to say that the students should know at what depth they are working at. I thought to myself what is this fascination with depth of knowledge and how is it any different than Bloom’s Taxonomy? 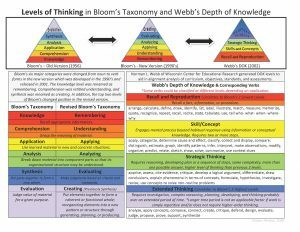 The answer to my question is there is not any difference between Webb’s Depth of Knowledge and Bloom’s Taxonomy. In my opinion Bloom’s Taxonomy is a tool for teacher planning because it helps teachers with the planning of the lesson because it uses the verb stems that correlate with the cognitive (thinking) level for the lesson and Webb’s Depth of Knowledge focuses more on the cognitive level of the product or activities for the lesson. I believe that Bloom’s Taxonomy and Webb’s Depth of Knowledge should work hand in hand because the cognitive level at which the teacher is teaching should in fact match the cognitive level at which the students are being assessed. Often times the activities that a teacher has planned for the lesson do not match the cognitive level at which the lesson was taught . For example, if a teacher’s lesson objective states the students will identify and describe landforms then the activity or independent practice should include an activity that requires the students to choose a landform from a map and use a bubble map to describe the characteristics of that particular landform which matches the cognitive level of the lesson’s objective. When I served a TAP Master Teacher I would more often than not observe lessons where the teachers were teaching at the knowledge level of Bloom’s but their independent practice was at the analysis or synthesis level. This was always a recipe for disaster for the lesson because the students were supposed to have learned the content during the modeling and guided practice at the appropriate cognitive level, however when they are released to complete the independent practice the cognitive demand of the activity is too much for the students. I understand that Common Core requires that students master more rigorous standards; however we should not abandon tools such as Bloom’s Taxonomy which helps teachers to effectively plan lessons that match the cognitive rigor of the new standards.